style, we’ll take you on a journey to develop your voice to its highest quality. 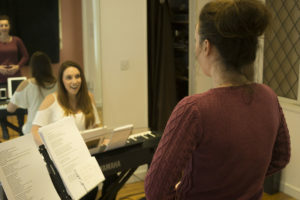 So, whether you are a lover of pop, musical theatre, classical, jazz or country, Barton Court Studios is the place to take your singing to the next level. We also coach choirs, small groups and bands in harmony and performance skills. Breath Control, Scales and Arpeggios, Rhythm and Timing, Musical Theory, Performance Skills, Bridging and Blending your Voice, Confidence Boosting, Harmony Skills, Examination and Audition preparation and Performance skills. Give the gift of Singing? Vocal Lesson and Recording Vouchers are available for £49.99! We also offer to take our students through their vocal exams in Rock and Pop with Trinity and Rockschool exam board. One of the wonderful things Barton Court Studios provides is the opportunity to perform. Make sure your all booked to perform at our next Open Mic Event. every 6 months our team work towards our next show. This gives our students a chance to Sing/Dance / Act / Work as a team and Perform.